Find the Kenmore refrigerator water filter you need to keep your water and ice tasting clean. Kenmore recommends to replace the water filter every 6 months. Some Kenmore refrigerators tell you when to replace the filter. Depending on the Kenmore refrigerator model you have, the water filter will be installed in either the inside, lower bottom, or on the back of the fridge. When you know it is time to replace the water filter, we have the 5 most popular water filters for Kenmore refrigerators below at the lowest price available. If you have a Kenmore refrigerator you will need to replace the water filter. The water filter cleans the water for the ice and the water. You may start to notice a bad taste in the ice cubes or the water. When this happens, replace the filter ASAP. It needs to be changed every 6 months either way. 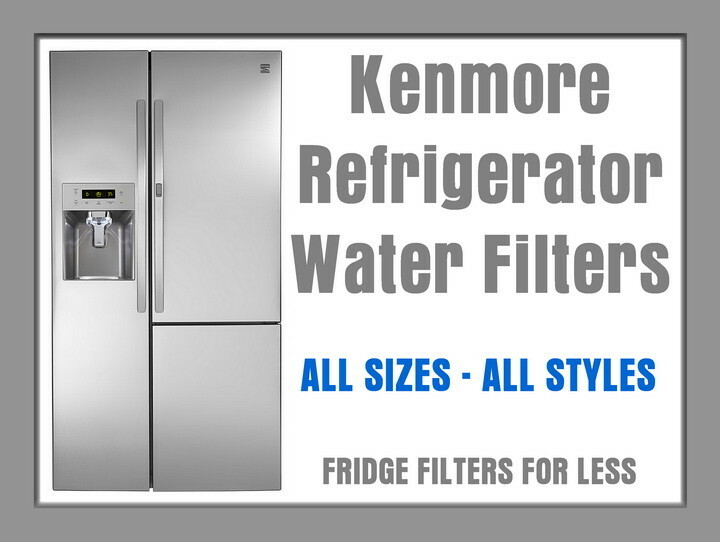 Do you need help finding the correct Kenmore refrigerator water filter? See below for the top selling Kenmore filters. This Water Sentinel refrigerator water filter contains a compressed carbon block which provides tremendous capacity to remove and/or reduce impurities and sediment that may be present in your drinking water.Kenmore Filters – 46-9010, 46-9902, 46-9908. Filter reduces contaminants ranging from lead to chlorine for up to six months. Fits Kenmore models. The Kenmore Clear 46-9690 is compatible with part numbers 9690, 469690, 46-9690 4609690000, 46-9690, and ADQ36006102. It fits refrigerator model number 72053. This fitler is used to improve the taste and clarity of water used in your refrigerator. Kenmore fridge 9990 filter, use the original manufacturer product. They don’t leak, they always fit, and water tastes better. Do you know any more info on how often to change a Kenmore refrigerator water filter and where to buy for less? Please leave a comment below. Previous post: Whirlpool Refrigerator Water Filters – How Often Should I Replace The Filter?